This spacious and beautifully appointed Mini Suite features a King bed, desk, sitting area, microwave, fridge, coffee maker, Wi-Fi, hair dryer and 32 inch flat screen TV. The over-sized deluxe bathroom offers comfort at every turn, with a walk-in shower and large whirlpool tub perfect for soaking in after a day of adventure. This spacious and comfortable two queen room features a 32 inch flat screen TV (equipped with HDMI and SD card slots), microwave, fridge, coffee maker, hair dryer, iron and ironing board, alarm clock, sitting area, free Wi-Fi and all the comforts of home. 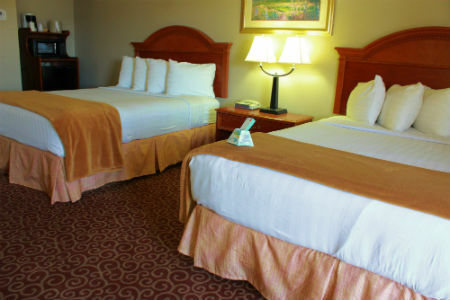 Room also offers either a balcony or patio for relaxing after a long day of sightseeing. Don’t forget our full breakfast buffet with everything needed to start your day off right. 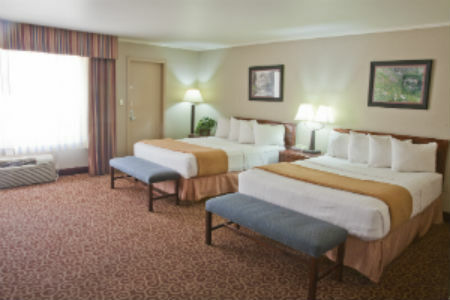 This spacious room is ideal for the business traveler, with lots of room to spread out and get the job done. Our Executive Suite offers free Wi-Fi, a work desk, King bed, 42 inch flat screen TV (equipped with HDMI and SD card slot), sitting area, large bathroom and a bonus room with a double bed. It also includes a microwave, fridge, coffee maker and all the extras needed to make your stay a comfortable and productive one.